Somehow or other we managed to slip under the radar or through the cracks or over the transom, or maybe it was just an outright mistake, but our entry to the Bay Area Maker Faire was accepted again this year. We don't think the Maker Faire people can take it back, even after they find out our homebuilt automobile runs on ordinary pump gas. A cursory inspection of the other accepted entries found no other Locosts, but the Maker Faire will no doubt feature a range of vehicles from electric dune buggies to electric trucks to electric motorcycles. So lots of variety. You should check it out. In our last episode we entertained the idea of taking on a new project, with the aim of preparing our Locost for the Maker Faire. None of the projects we discussed seemed feasible, but since that's been the case for everything we've done so far, we decided to tackle the exhaust, because we like cutting, grinding, and welding metal. The only downside would be the new exhaust likely wouldn't fit. In consideration of this, we decided to build a completely new exhaust rather than try to modify the old one, which would give us the option of re-installing the old exhaust after the new one didn't fit. The problem with building an exhaust that fits is that you can't measure the exhaust. You could if it was straight, but it's not. It bends everywhere. You'd have to measure it in three dimensions. One dimension is hard enough. Building the exhaust the first time was easier because we could build it to approximately the right size, and then fit the rest of the car around it. This time we'd have to do the opposite. 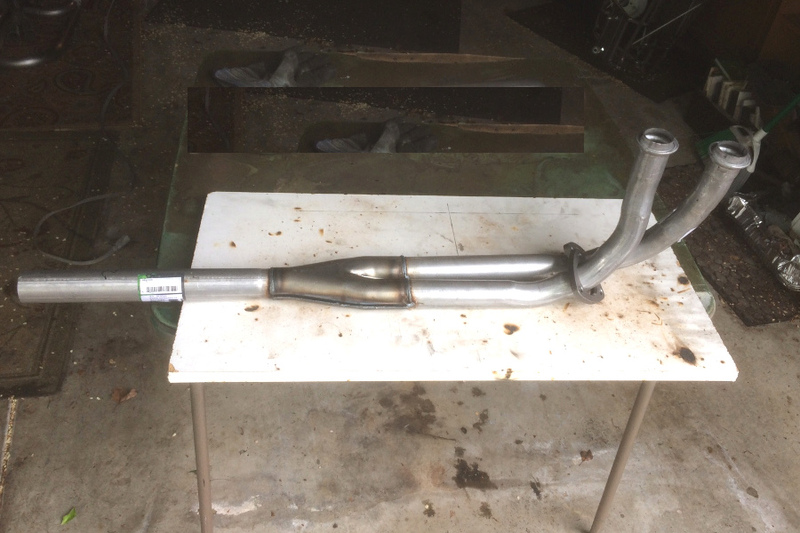 We decided the only chance we had to get it right would be to build the exhaust in two pieces, hang each piece on the car, and only then connect the two with the proper length of pipe. We already built the rear half of the exhaust last fall when we welded ends onto our giant muffler and added a tailpipe and hanger pin. So we only had to build the front half, which we knew would be more complex, with downpipes connected to a Y-pipe through a series of bends, but we did it once before, and while it didn't end up looking very good it seemed to do the job. 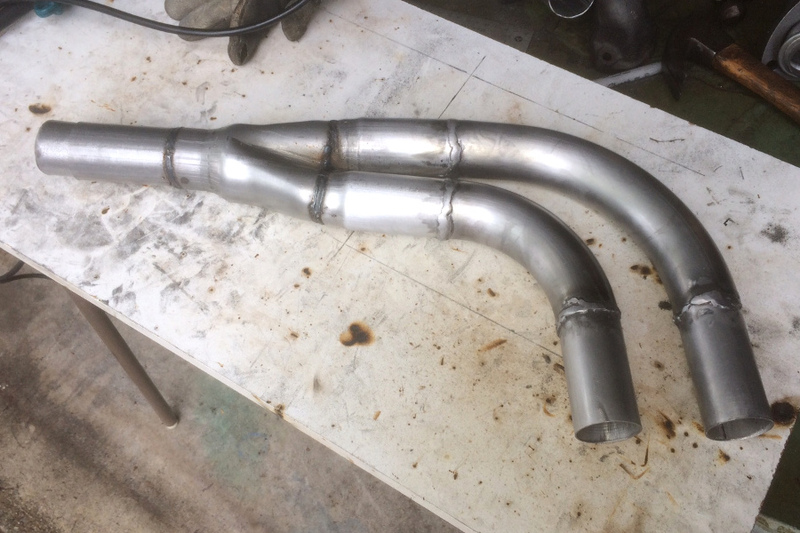 The only tricky part would be the tops of the downpipes, because we don't remember how we made them, except to recall that they didn't fit initially and we had to add some makeshift pieces to get them to work. 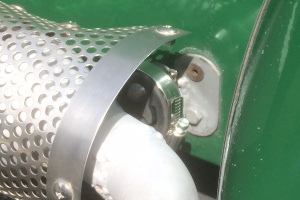 Another problem with building a new exhaust, besides the cost, is the availability of MGB exhaust flanges. You need two of them to clamp the downpipes to the manifold. 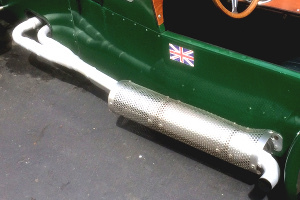 We have two, but they're currently in use on the old exhaust, which we'd hoped to keep intact. The flanges don't look that tough to make, except for getting all the holes in the right places, which would be tough. Moss Motors sells these flanges for around $100, plus shipping, which sounds like a lot but they come with downpipes and a Y-pipe attached, which would be perfect if we hadn't already bought downpipes and a Y-pipe. The more we looked at it, though, the more we thought the Y-pipe on the Moss website looked nicer than the one we bought. So we gritted our teeth and placed the order, and when the parts arrived the Y-pipe turned out to look worse in person, and too small for our beefy exhaust, so we ended up not using it. Of course that meant a hundred bucks plus shipping for two cast iron flanges. On the other hand we got a couple of genuine MGB downpipe ends in the bargain, just the right size and ready to weld to our downpipes. So not a total loss. A hundred bucks, though. Still pretty bad. We got a bit of a surprise when we removed our old exhaust system, although in retrospect we probably should've expected it. Shortly after announcing right here on this website that our brilliant new exhaust hanger design was so uber-reliable that it couldn't possibly ever break, it broke. 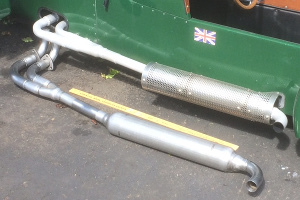 The rubber split at the bottom hole, allowing the muffler to drop right out. As usual when our exhaust hanger fails--and we have a lot of experience with failed exhaust hangers--we have no idea how long the hanger was broken. However, since the broken hanger was likely the cause of our bent heat shield, probably a month or so. Maybe longer. The rubber connector was obviously way too flimsy, so we bought a bigger one, and just to be sure, we wrapped it in a hose clamp after installing it. 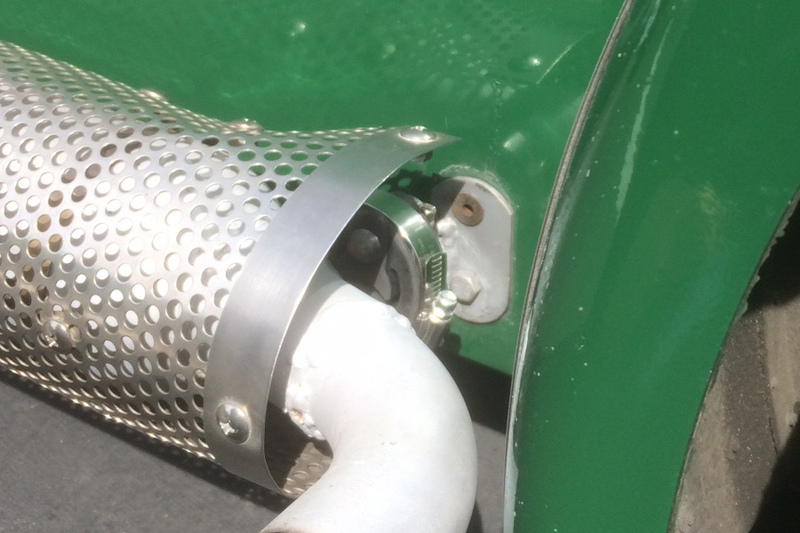 We're not sure if this is a viable solution or not, but it doesn't seem possible for the rubber to split with a hose clamp around it, no matter how much the muffler tries to shake it loose. And it will try. We think there's still sufficient play in the hanger for normal everyday driving, and certainly heat expansion, but if it doesn't work we'll have to eliminate rubber from the equation altogether, and weld the muffler to the side of the car. Or something similar. 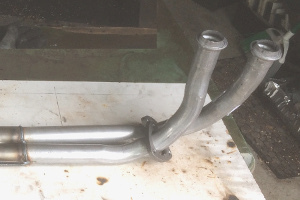 When we built our first exhaust system all those years ago, we were pleasantly surprised to find that exhaust pipe manufacturers had thoughtfully expanded one end of each pipe, so that the small end of one pipe would slip inside the expanded end of the next pipe. 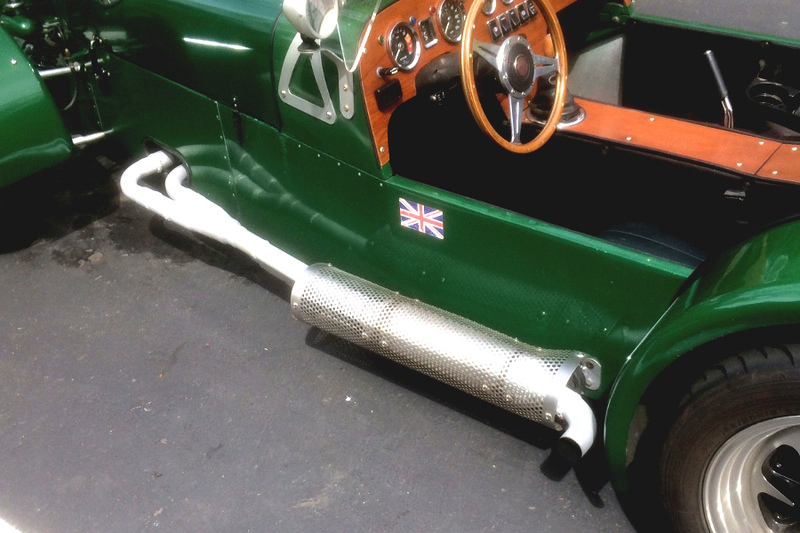 Taking full advantage of this clever design, and not aware of any other way to join exhaust pipes, we built our whole exhaust by fitting pipes together in whatever sizes we had available. The end result was not terribly handsome, with lots of welds and pipe diameters changing frequently along their lengths, but it worked. For our new system we decided to use much better looking mandrel-bent exhaust tubes and straight sections cut to the exact lengths we needed, all in the same 1-7/8" outside diameter. We think this is what the pros use, because these pieces don't have expanded ends for amateurs like us, and they don't slip together, which means you either have to know what you're doing, or at least have an alternate method for joining pipes. Pros can no doubt weld pipes end-to-end, because they're pros. We could do that too, but not without blowing holes everywhere and adding ten pounds of filler to each joint. We thought we could simulate what the pros do, however, by using sleeves. Adding a sleeve is like expanding one end of the pipe. The only difference is, we put the sleeve on the inside, so it's like reducing the end of the pipe instead of expanding it. 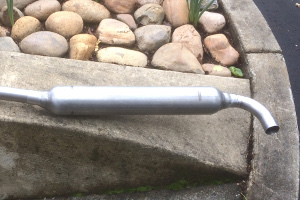 This gives you an attractive, constant outside diameter along the whole length of your exhaust. 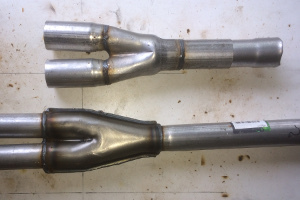 The only reason exhaust pipe manufacturers don't do it this way is because they understand that the outside of the pipe is not important, and what you really want is a constant inside diameter, to keep the exhaust gases flowing smoothly. We're okay with the way our exhaust gases flow. 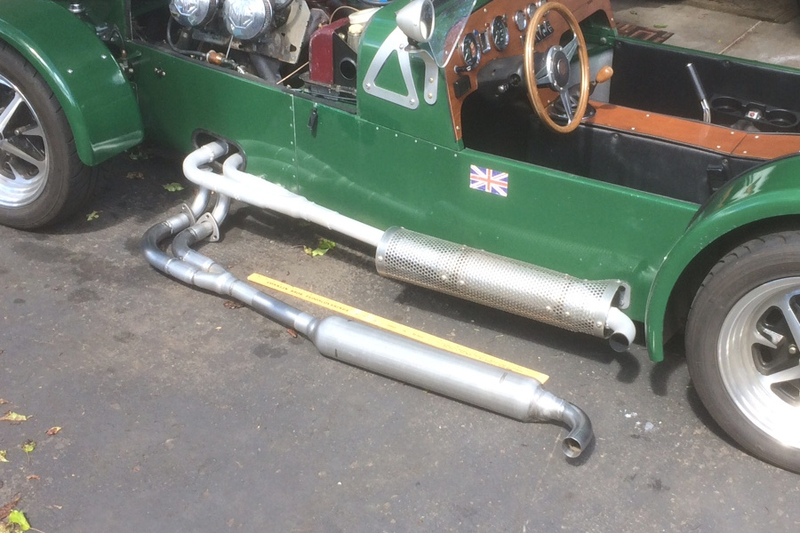 It might get a little bumpy in there, but our pipes are a lot shorter than most cars, and bigger around than the 1-1/2" pipes on an MGB, so we don't think we're losing any performance to pressure buildup inside the exhaust. We might be losing performance to our giant muffler, but we can make up for that with more throttle. One of the primary benefits of a quieter exhaust, besides the reduced noise, is the ability to stomp on the gas without totally embarrassing yourself in public. We're kind of looking forward to that. But first we have to finish the exhaust. We've cut all the pieces and welded most of them together, but we're not ready to weld the front and rear halves together until we're sure they'll fit the car. To do that we'll have to remove the old exhaust again, which will take the car out of action for a few days, so we'll have to wait for the next rainy patch. The good news is, the parts look like they fit when we lay them next to the car, and after an hour or so of welding they should be ready for paint. The bad news is, we'll have to paint them and wait for the paint to dry. Hi- Great blog- you've convinced my brother and I to each build an MG Locost. I previously built a Hatz biplane so I have an idea of the magnitude of this project but I'm confident that the family Obsessive-Compulsive Disorder gene will see us through. One question: for the A arms you specify 1" DOM tube with wall thickness 3/32". A brief search of tubing suppliers suggests that this this is made of unobtaniuim. Do you have a source for this tubing? Online Metals has A513 DOM tubing in 1" x .095". Alternately you could use 4130 steel in a 1" x .065" wall size.